Look at this... What a shame! This is what a Haitian public school (ecole National) look like in 3eme Section Brodequin, Aquin, Sud Department in Haiti. 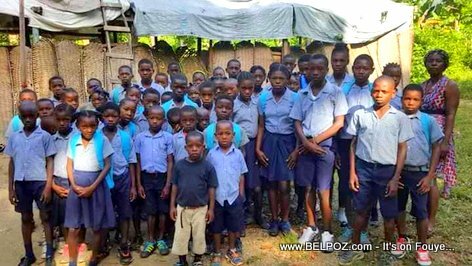 You can tell that this is an actually Haitian national public school (ecole nationale) by the uniform the students are wearing. This is the shameful reality of how Haitian students are receiving their education in Haiti.